A cultural institute functioning under the State Department of Culture. The Akademi was set up in Thrissur district, on 26th April 1958, to support and promote dance, music, dramatics, temple arts, ritual arts, magic and Kathaaprasangam (story recital). The Akademi, formed under the leadership of Kerala’s first chief minister, E. M. S. Namboodirippadu, and critic and education minister Joseph Mundassery, was dedicated by the then Prime Minister Jawaharlal Nehru. Initially, the Akademi functioned in conjunction with the academi for literature but was granted a building of its own in 1982. In 1998, an Artistes’ Cottage was built for visiting artistes to stay in Thrissur, the town where it is headquartered. The Akademi also runs a reference library built in the name of social reformer, M. R. B., and a regional office at the Vailoppilli Samskriti Bhavan in Thiruvananthapuram, started in 2006 to meet the demands of increasing work. Music maestro Manku Thampuran was the first chairperson of the Akademi and P. K. Nambiar, its first secretary. Others who held the post of Chair included G. Sankara Pillai, Vaikkom Chandrashekharan Nair, T. R. Sukumaran Nair, Dr. K. J. Yesudas, K. T. Mohammed, Thikkodian, Kavalam Narayana Panikkar, C. L. Jose, Bharat Murali and Mukesh. 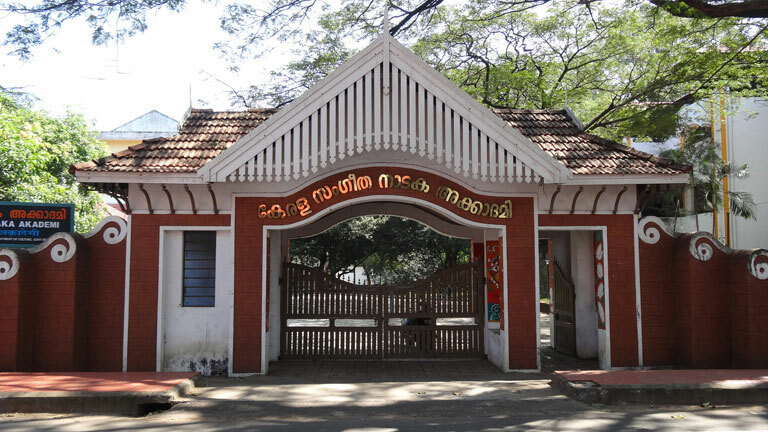 The Akademi made its mark on Kerala’s cultural scene with the drama camps organized under the leadership of G. Sankara Pillai in Sasthamkotta, Thrissur and Nileswaram, and its various activities in the field of dramatics spearheaded by talented and dedicated artistes like Kavalam, Adoor Gopalakrishnan, Gopi, Nedumudi Venu, Aravindan, Jagannathan, P. K. Venukkuttan Nair, Ramanujam and Vayalar Vasudevan Pillai. In 1988, a district arts association was formed under the aegis of the Akademi. Other milestones in its history included a camp for the Mohiniyattom dancers of Kerala held in 1990, a drama workshop for women in 1998, programs conducted for the very first time in Chennai and Kolkata, in the year 2006 and a folk and tribal fest conducted in Thrissur in 2007. Apart from its facilities for artistes like the Model Regional Theatre, Thoppil Bhasi Natyagriham, Murali Theatre, Dakshinamurthy Vanajyotsna Theatre, C. J. Thomas Conference Hall and the M R B Library, the Akademi offers venues for rehearsals at its main building. The building also houses the Chembai Digital Archives, the Chembai Museum and the Jose Chirammal Museum Square. In 1963, the Keli, a magazine that served as its mouthpiece, was begun. A number of awards including the Swatipuraskaram, SL Puram Sadanandan Nataka Puraskaram with a prize money of Rs.1 lakh, for outstanding contributions in the field of classical music and drama respectively. The State Amateur's Drama Prize, the State Professional Drama Award and the Pravasi Amateur Drama Award were also instituted by the Akademi. To know more about Kerala Sangeetha Nataka Akademi click here.